Think prevention is more expensive than treatment? Think again. The cost of all those over the counter and prescription medicine's can really add up not to mention the side effects possibly associated with them. Wouldn't you rather not get sick in the first place? Even if you did manage to catch something, wouldn't you much rather shorten it than have it drag on and on? 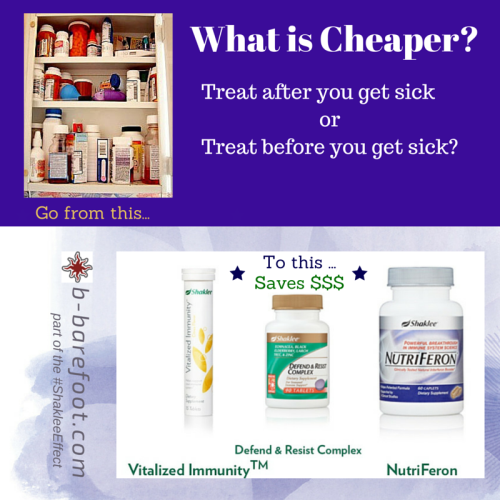 It's so much easier to prevent illness than having to treat it after you get sick. Shaklee products will support you to help keep your immune system strong and functioning at it's best. For those rare occasions when you do catch something your immune system will be better prepared to fight it helping your body to recover faster. Let's face it, we live in a germ fest world! Our best defense is a super strong immune system. Shaklee's Vitalized Immunity is packaged to easily carry with you. Just drop the fizzy tablets in liquid. Great for a quick boost to your immune system when you are pretty sure you will be entering a germ filled area. Defend and Resist is designed to take when you first feel that tickle or ache. This product is designed to take as needed, but not all the time. A healthier choice for your medicine cabinet. It helps boost your immune system so it can do what it's designed to do. NutriFeron Words can't express how I feel about Nutriferon! The 20+ years of research history developing it, Shaklee's world wide patent on it, used instead of antibiotics in Japan only touch the tip of why you want to seriously consider adding it to your daily regimen. This 20 minute video presentation about Nutriferon explains..